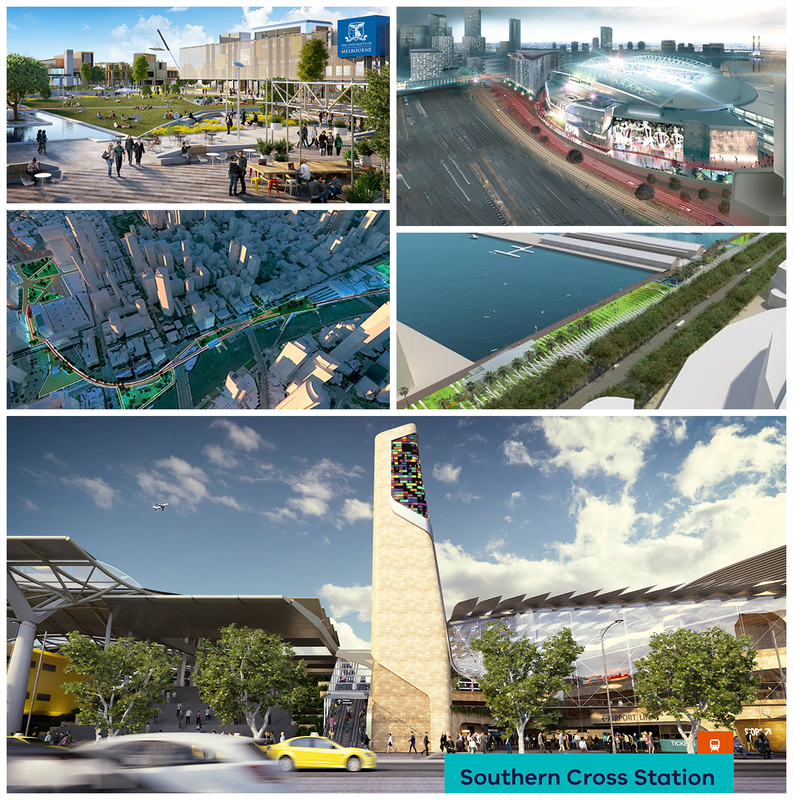 Earlier this year, I penned a piece highlighting the convergence of a number of key rail infrastructure projects at Southern Cross Station, and how there was a critical need to master plan not just the station but the greater precinct to accommodate a potential Airport Link Interchange and a new station box for Melbourne Metro 2.0 under Wurundjeri Way. The puzzle pieces have begun to fall into place with the recent announcement of the market-led AirRail Melbourne proposal with IFM Investors leading a consortium including design and engineering expertise from Aurecon, Cox Architecture and Grimshaw. 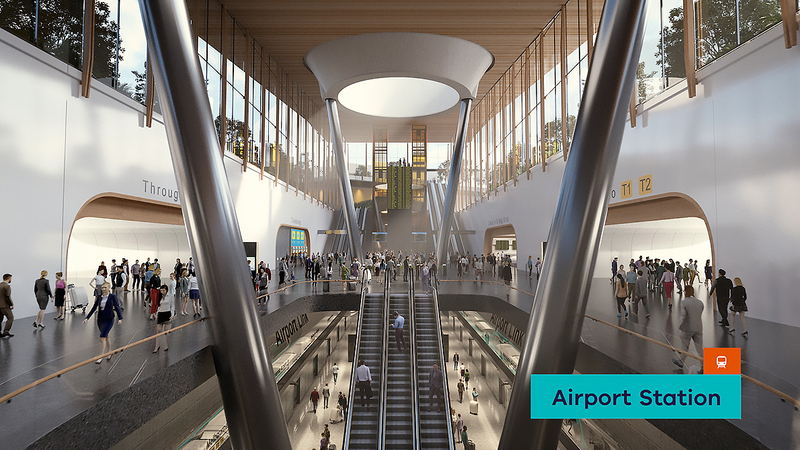 We’ve been working with AirRail Melbourne to develop the Airport Station concept design. Offering a distinguished sense of place, our design for the integrated underground station supports Melbourne Airport’s vision for a seamless passenger experience with world-class linkages between the airport, city and regional Victoria. Comprising IFM Investors, Melbourne Airport, Metro Trains Australia and SOUTHERN CROSS STATION PTY LTD, AirRail Melbourne’s plan for the city’s long-awaited airport rail link promises the fastest travel times, a premium around-the-clock service and enhanced access for regional Victorians. Although the Suburban Rail Loop has up until recently occupied much of the spotlight in terms of the Andrews Government's Public Transport strategy, should it be re-elected, Premier Daniel Andrews made it clear there will be further announcements regarding infrastructure investment in the lead up to the election. 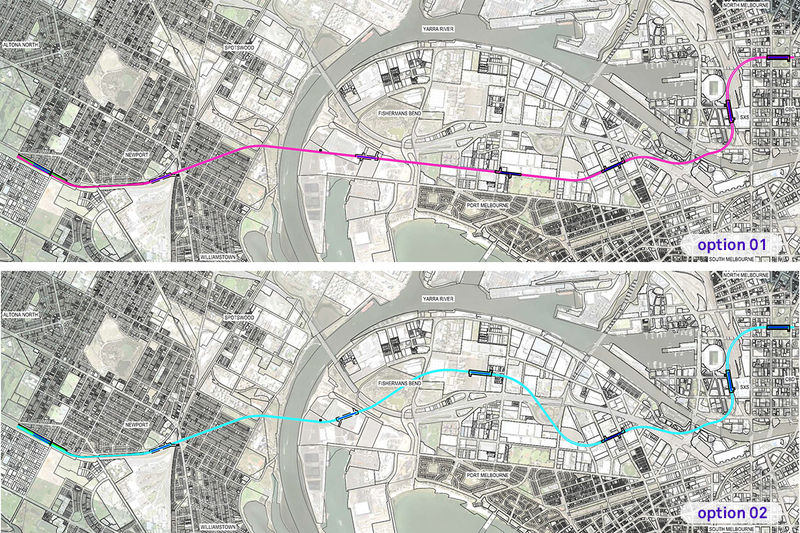 It is the opinion of this Editor that any announcement regarding Melbourne Metro 2.0 will coincide with the release of the final Framework and Planning Controls for the Fishermans Bend Urban Renewal Area. Currently two alignments have been canvassed - one through Wirraway; and another through the Employment Precinct. Detailed Precinct Plans - which will come later - will further refine the specific locations of station entries however, it wouldn't surprise me if the Employment Precinct alignment is adopted as that will serve the University of Melbourne's new $1bn Engineering Campus, which is set to occupy seven hectares of the former General Motors Holden (GMH) site. The proposition of a direct connection from the Employment Precinct via the heart of what will become Melbourne's second commercial centre at Sandridge, in addition to the ability to interchange via a new station box at Southern Cross Station for the airport, seems for the most part, like a no-brainer to me. Urban.com.au's recent podcast with Greens MP Sam Hibbins outlined that party's prioritisation of Melbourne Metro 2.0 in order to increase capacity on the network to cope with population growth and continuing to untangle Melbourne's dated rail network to become a true Metro. Will the ALP and Coalition follow suit? Melbourne Metro 2.0 will however result in increased patronage through Southern Cross Station particularly when combined with the AirRail Melbourne proposal - should it or a derivative proceed after the Melbourne Airport Rail Link and Suburban Rail Loop business cases are completed - putting further strain on the station and the precinct. Further pressure on the precinct is also coming via increased high-rise development activity, again highlighted by Urban.com.au recently, with sewer upgrade works currently underway to address the increased residential population in the area. Already in morning and afternoon peak, the footpaths on the corners of Collins/Spencer and Spencer and Bourke are at capacity, with this also occurring during event mode at Marvel Stadium (formerly Etihad) particularly during the AFL season. The connection from Southern Cross to Marvel Stadium via the Bourke Street pedestrian bridge is also struggling to cope during event mode, becoming a bottleneck as exiting fans attempt to enter the station. Developments around the stadium have attempted to alleviate some of the pressure however, despite best intentions have only really served to move the problem elsewhere. 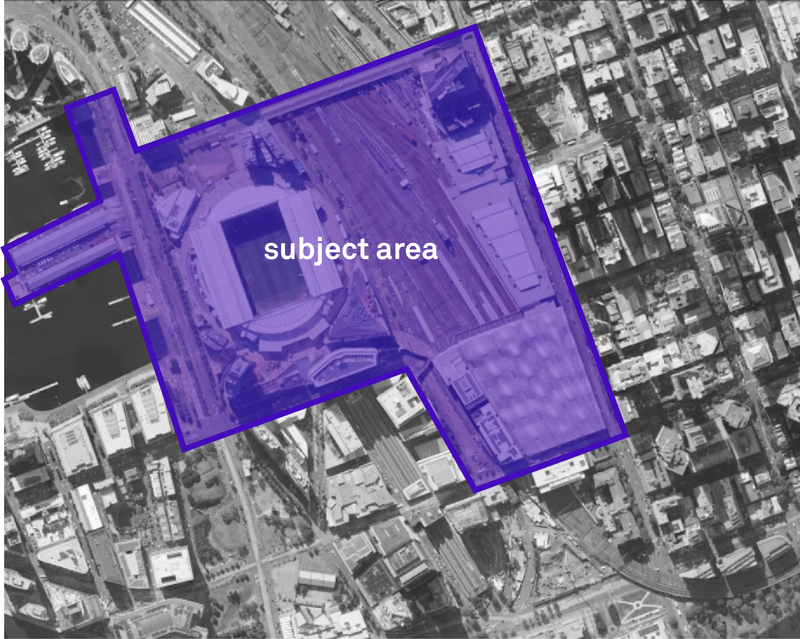 With the AFL and State Government working on a substantial upgrade of Marvel Stadium - with Cox Architecture having previously developed concepts - there's an opportunity for a fully integrated Master Plan of the area bound by Collins Street, Wurndjeri Way, Bourke Street, Harbour Esplanade, LaTrobe Street and Spencer Street. This would allow for a reduction in redundant works as other projects in the area are delivered over the course of the next 10 years, with the potential to incorporate some of those outlined by Mayor Sally Capp with the two critical rail projects and the upgrade of Marvel Stadium to truly connect the Melbourne CBD down to Victoria Harbour. Look out for Part Two in coming weeks, which will be a high level study of what an integrated Master Plan for the Precinct might look like.